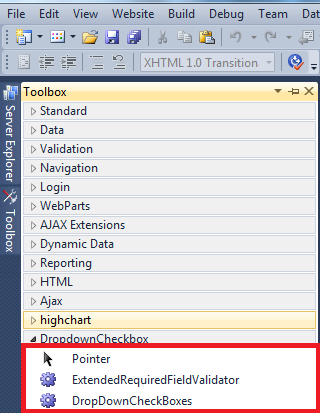 In this article I am going to explain how to populate and validate the Dropdowncheckbox custom control in asp.net. In previous article I have discuss about DLL of DROPDOWNCHCKBOXES. When you added the control to toolbox, you will saw 2 control dropdowncheckboxes and validate control named ExtendedRequiredfiledValidator. I have created a table Tb_State and insert some dummy records. <tr><td>Select State :</td><td><asp:DropDownCheckBoxes ID="ddlcheckbox" runat="server"
Create a method to bind the control and call it on page load. statenames += item.Text + "\n"
Now build and run the application.